If this review had a title, it would be “A Perfect Night at the Theater.” Shining City is a well-crafted, thoughtful play full of surprises by Conor McPherson, interpreted impeccably by a talented cast that includes Mark H. Dold, Wilbur Edwin Henry, Deanna Gibson, and Patrick Ball. Director Christopher Innvar knows how to use the intimate space of the St. Germain stage to full advantage, and draws the audience into the action from the subtle, pre-curtain rainfall in the background to the last moment of the 95-minute production that takes your breath away. The story begins with the awkward first meeting of a psychologist and his a new client. Ian (Dold) and John (Henry) engage in the initial small talk the way men do—staccato utterances peppered with affirmation and uncomfortable attempts to go beyond the superficial, but as John’s pain unfolds, the audiences learns of his late wife and his personal demons. John is suffering and knows that desires are sometimes as misleading as the thoughts he battles in his mind. He is searching for a reality that he knows may not exist, and the reality that emerges brings the stories of the two men into alignment, and simultaneously bridges mind/body, and theare/reality. The artistic vision shared by every member of the cast and production team is so clear, the audience can’t help but be moved by the individual stories and the sense of aloneness that emerges in Ian’s cold little Dublin office. When John comes to terms with his loss in a brilliantly effective monolog, Ian’s body language not only communicates understanding on multiple levels, but the audience is treated to a master class in acting and interpreting the text. 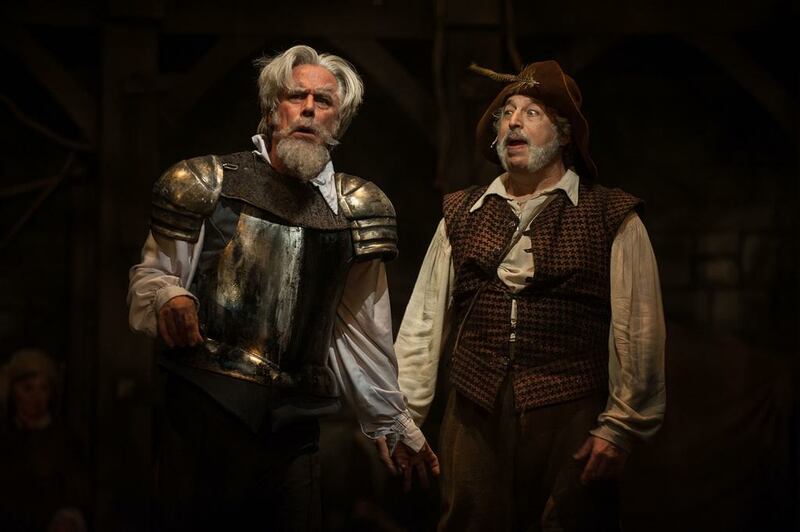 Dold and Henry are a formidable duo, and with McPherson’s words and Innvar’s guiding hand, the production gives its viewers something to think and talk about. The title, "Shining City," refers to a Biblical passage (the play is Irish, so guilt and religion are expected) but the storytelling is unforgettable. Fresh from a Boston performance of this and other Monteverdi works, the artists from the Boston Early Music Festival delivered a confident and stunning performance in the Mahaiwe. Eschewing more modern presentations with many on each part, Conductor Stephen Stubbs chose to offer the audience the transparency and clarity that best benefit this late-Renaissance sacred work, using nine singers and 15 instruments. The Vespers of 1610 was performed in its entirety and in the order in which the composer published it. In his pre-concert talk, co-Artistic Director Paul O'Dette convincingly described the evidence used to make this choice. These remarks of both Stubbs and O'Dette helped clarify the architecture of the piece and showed not only the reverence in which it is held, but the amount of musicological research behind this performance. Utilizing instruments of the period, the ensemble achieved a well-blended sound whether supporting vocal parts or performing alone. Particularly outstanding was gambist Erin Headley, who had barely a measure of rest but who provided an anchor for the entire continuo section with her smooth and fluid sound. The section included the director at times, playing chitarrone, an organ, cello, double bass, harp along with Odette on chittarone. Upper line instruments made singular solo and ensemble contributions appropriately, including the longest trombone ever seen by this reviewer. Cornetto playing was particularly effective, but even so, the use of recorders by the same players for brief respites was charming and welcome. The vocal ensemble was faultless in pitch and drama. Their commitment to the text and to other parts was clear in both their solo "concerti" and ensemble sections. The audience let it be known that the entire performance was a joy by calling the players and singers back several times. It is a wonderful partnership to have BEMF in Western MA and it is hoped such appearances will increase. Four characters in search of success as fiction writers hire a writing guru, bond in various ways (not only literary), and occasionally discuss the meaning of art. 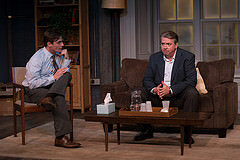 “Seminar,” a well-paced play by seasoned playwright Theresa Rebeck, entertains audiences with some effective one-liners and a bit of predictability. This well-acted vehicle opens New Century Theatre’s 25th year, and was received with laughter and appreciation by a nearly full house at opening night. Keith Langsdale brings a vituperative interpretation to his character of Leonard, the writing coach, embellishing the mean-spirited comments with appropriate physicality. Even when the audience learns its probable origins, the nastiness seems overdrawn. As his critiques assault each writer in turn, the blade becomes even sharper. Myka Plunkett is engaging as Kate, the light-footed, preppy Bennington graduate and the first writer whose prose suffers Leonard’s attack. The lancing continues, until there is finally some hope that good art might exist among these writers. The surprise at the end comes from whose art “wins.” In the same scene, Kate is unnecessarily diminished. How Rebeck treats both female characters is a disappointment. The use of a folk harp for sound, both live and recorded, enhances the production aurally, as did the use of multiple recorded speeches during the play’s only and most significant stage change. Often, the audience finds itself watching Langsdale’s back as he deliveres significant speeches, thanks either to direction or to set design. Somewhat buried in this script is some insights about creativity and the courage it takes, a theme worth addressing that makes the play worth watching.